The Warner House in Portsmouth, NH has a small but excellent collection of 18th century – early 19th century ladies shoes. 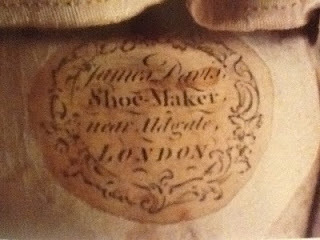 One pair of particular note are those proudly announcing that they were created by “James Davis, Shoemaker, nr. Aldgate, London.” As part of a larger research project, the author, with the assistance of Tara Vose, Warner House Board Member, and Bridget Swift, Research Associate, TheBranchCreative, has examined the work of Davis, or Davis in partnership with Thomas Ridout, for close to three years. A publication is forthcoming, with contributions by acclaimed contemporary London shoe designer, Emma Hope, available in 2013/2014. The shoe shown here (Accession #743) was worn by Mehitable (Mehitabel) Rindge (b. 22 September 1725- d. 1803) who married the Honorable Daniel Rogers, of His Majesty’s Council for New Hampshire. Ten years her senior, the couple were both born and raised in Portsmouth and are buried at the Proprietor’s Cemetery. An especially elegant shoe of cream (or possibly another color, much faded) silk– note the higher than usual heel at 3” rather than the more typical 21/2” for the Colonial American consumer – it is very well worn. In addition to the Davis label, the shoe also boasts a strip of subtle pink silk across the interior of the tongue, meant to be exposed ever so slightly as the wearer walked across the room or down a flight of stairs. The contrasting pale pink silk, in combination with shiny paste or jeweled buckles and the sheen of the silk would have created a refined fashion statement and, with the heel, a striking silhouette. The couple’s oldest child, Mark, was born in 1762, so they most likely married in the early 1760s. Given the style of the shoe and knowing its maker, a fabrication date falling between 1760-1770 would be appropriate. Further, the higher, courtly heel may have been favored by Mehitable earlier in life, prior to the birth of five children. 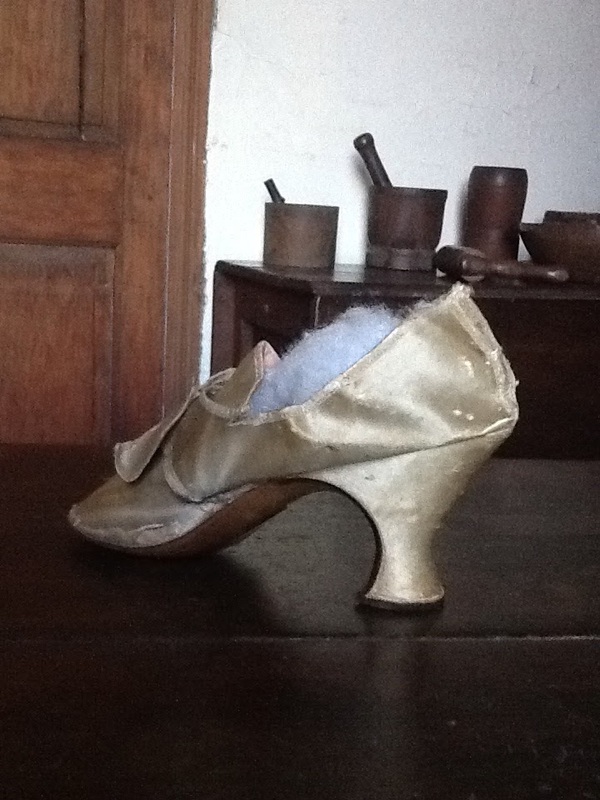 These may have been her wedding shoes, or due to her husband’s position as a member of the King’s Council in New Hampshire, they may have been necessary accessories for her position in society, explaining the higher than usual heel. Known after the Revolution for his apothecary business, Rogers was in fact examined by the New Hampshire Committee of Safety for “being unfriendly to the liberties of America,” on Thursday, November 23, 1775. No evidence was found against him and so he was dismissed without incident. He would subsequently resign his post due to the Acts of British Parliament. Thank you to Carolyn Roy and Louis Richardson, Co-Curators, Warner House, and Tara Vose, Warner House Board Member, for their assistance. All images are courtesy of the Warner House. The Warner House: A Rich and Colorful History. Joyce Volk, ed., The Warner House Association, 2006. 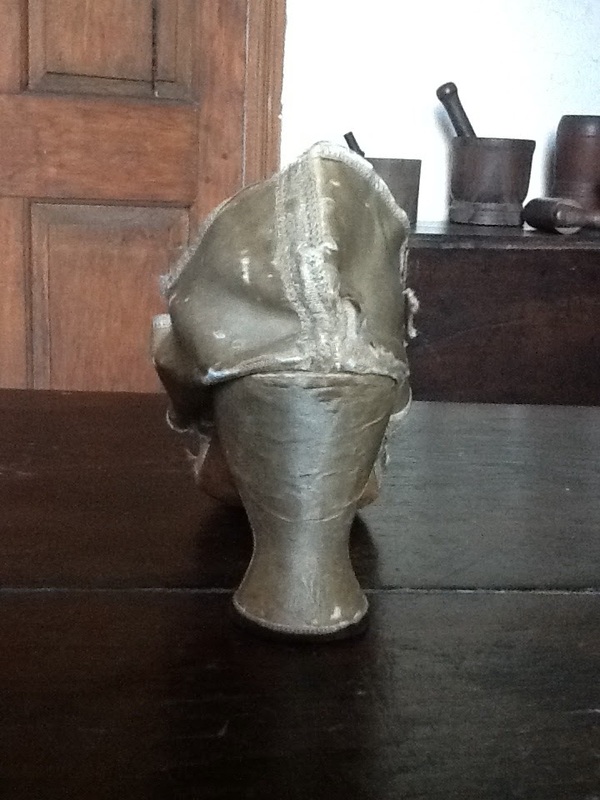 Worn, torn, ripped & shattered shoes, 1760-1790. Construct Your Own Victorian Embellishments!